This is the home page for my VFD tube clock project, the TC18. The TC18 is a clock built around an old Russian IV-18 VFD tube. You can read the story of how it came to be at this blog post. I have a single clock for sale on eBay! This is the only one I will be selling, so please bid on the auction! IV-18 Russian VFD (Vacuum Fluorescent Display) tube for display. ATmega328P microcontroller running at 16MHz. Running Arduino bootloader for easy update. 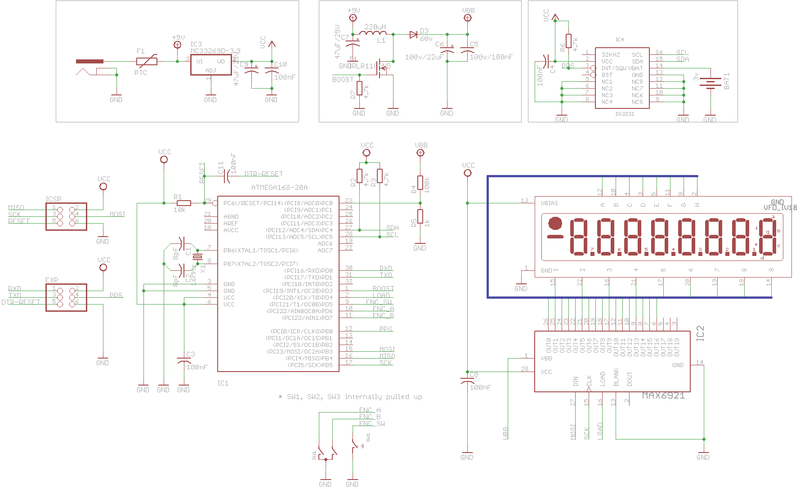 DS3231 RTC (Real Time Clock) chip for keeping extremely accurate time. Lithium battery for keeping time during main power loss. MAX6921 VFD driver for controlling the 17 high voltage outputs. Custom high voltage boost switching power supply with voltage feedback; controlled by CPU. EEPROM storage of all configuration parameters. Rotary encoder with push to select for configuration menus. Custom aluminum enclosure designed by John Pfeiffer and realized by myself. Your project amazed me. Something I have wanted to do all my life (62yrs). I am a electronic engineer of the old school and fascinated with the amount of labor of love you put into this. If you start a company, you will be a millionaire soon. Good luck and will look for you on Facebook. I love the design. I have been thinking of making one myself, and I like how you used an external RTC in the circuit. I was wondering if you could throw a schematic up in pdf format, as I am using a different design program, and can’t import eagle files. I’m interested in building a VFD lamp but i have a problem with MAX6921 i live in Poland the chip isn’t available in my country, did You buy the chip form Maxim od they send You a sample? I wanted 3 samples (need to make 3 clocks) but Maxim don’t seend them to my country eather. Have You got any ideas? believe they will ship worldwide. Ray, I put up a PNG of the schematic in the download section. I am definitely interested in buying one of those clocks if you ever happen to offer some. Please let me know if that happens. Awesome work! Very nice!!! just one question, is the free end of the tube supported at all? hard to tell in the pictures. could you put a version of the script that only handles time and vfd update (so no rtc or boost circut)? @peter – the code is really well documented. It should be easy enough for you to rip out the bits you don’t need. Feel free to email me at jason@vonnieda.org if you have any specific questions. There are different PLCC-28 sockets available and some have different pinouts. SMD vs. PTH, for instance. In any case, the data sheet for the socket you are using should show the pinout. Are you making a kit for this? I would love to have one and it looks like it would be a blast to assemble and program! That is one awesome looking clock. 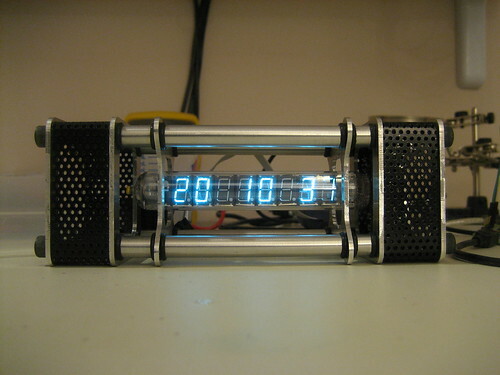 I have ordered and built the Ice Tube Clock from Adafruit, but I really like yours. You have many more features on yours, and you have the supercool Casing feature going for yours as a bonus. I don’t do programing, so I would have problems adding the features to mine. It would be really great if you decided to make a kit for your clock available. Hi Jason and Kevin, I would love to make a kit but I have not found a way to do it cost effectively. Many of the parts require extensive hand labor and lots of machine time on my little CNC mill. I am still trying to find ways to develop a kit, but nothing is going to happen soon I’m afraid. I would very much want to get hold of a kit for this clock….this is awesome. It would be a shame not to have this mass produced!!! This a great work of art! Very stylist. i’m still working on your clock, to build my own version. First of all i re-designed it, to be done with Throught Hole component exeption for VFD controller and RTC. Second, i need Umidity, so I added a DHT11 sensor instead RTC temp misuration. I’m also modifing software and your program is very amazing and some time not understandable for me. I’m working with Arduino from 2 month, but I became from PIC’s Basic programmer. Another functionality I’d like to add, is a light sensor, a photoresistor, to add a AutoBrigthness functionality. I tried to add sensor to AnalogPin3 and use Arduino Analogic utility but it does not work, display became crazy. As I can understand from your code, you use ADC in some “RAW” mode and is not possible to use it in arduino. Can you helpme with your code, to add this? My first idea is to remove voltage control interrupt function and handle is in main loop togheter with Brightness control, but i’m not sure. I am in the proses of making one would u be able to help me with the circuit bord. This is what has captured my atention into this hobby have never done any thing like this and I would love your help. Very cood build and beautiful PCB-layout! – I can see that you did away with the AC-drive on the Filament, with the small Brightness-gradient visible. It’s not THAT visible on the video, how about in real life ? The tests i’ve done with my IV18 tubes shows quite substantial gradient across the tube. Have you tried adding an auxillary winding on the inductor, with a grounded center-tap. This way you can power the filament with AC and avoid the gradient. I found the output connector on theschematic with PPS leg exposed. Is this an input for 1PPS external signal? Is the firmware source available for download?